Protected bike lanes are the only real difference maker. The ‘nice to haves’: bike parking, showers, wayfinding, etc., are only putting lipstick on the pig. While we are trying to do things right, we are not doing the right thing. Separating bicyclists from traffic is the only way to bring out larger numbers of cyclists. The majority of people who would bike are afraid to ride in traffic, and bike lanes are not enough to encourage that person to ride. If you truly want to make cycling safer, go get more cyclists. And, the only proven way to do that is to provide protected bike lanes. (2) Affordable transport should be treated as a basic human right because bicycling is an affordable means of mobility freedom from social isolation and poverty, and bicycling is often the only transportation option available to reach jobs in poverty stricken regions. Fittingly, the world’s premier international cycling planning conference focused on many issues. With urban growth exploding around the world, cycling issues related to planning healthy, sustainable and people-oriented transportation solutions were integrated with social justice and mobility freedom discussions from a global perspective. Bicycling was envisioned as an antidote to the assault of the automobile on the urban environment. Because children attract the attention of all and raise the emotional level, they have great political power world-wide. Safe mobility policies for children improve the landscape for everyone. Active mobility for everyone means safe roads and connections to public spaces and destinations. Children have the right to cycle: The Charter of Vancouver focuses on the future of children, worldwide. A part of culture and daily habits, education and health, and environmental sustainability, cycling produces undeniable positive effects on our lives. The right of children to cycle should be universal and ever present; because children who make jumping on a bike a regular part of their lives today can grow up to be healthy, happy and environmentally conscious adults. 7. To cooperate closely with cycling advocacy and promotion organizations and other citizens’ organizations to encourage more children to cycle more often. It was recommended that cycling be the cornerstone of international, sustainable transport policies. Cycling addresses the global problems of sustainable transport in a myriad of ways: congestion, energy conservation, air quality and pollution, exercise in an increasingly obese and dormant society, and escape from the confines of poverty stricken slums. The world is rapidly becoming more urbanized with many third world cities facing a flood of immigrants for which they are unprepared. Even, Western industrialized nations struggle to deal with growing urban populations and the ensuing additional automobile traffic. We must seek more efficient and affordable mobility solutions because there simply is not enough space to keep adding road capacity. Solutions must not only be affordable in fiscal terms, but in terms of livability. Active transportation as a mobility solution is a reaffirmation of the celebration of life – hope for a livable future. Many cities world-wide are not prepared for automobiles and the results are catastrophic. Most large third world cities are choked with traffic congestion, suffer from the resulting air pollution and struggle with mobility failure. There are insufficient public resources to build the necessary infrastructure to accommodate the assault of automobiles. The allocation of transportation budgets can be viewed as a moral issue, the budget as a moral document. “Funding is the sincerest form of rhetoric,” and the only way to make a difference. Funding must be reduced for increasing highway capacity and shifted to supporting alternative modes of transportation. 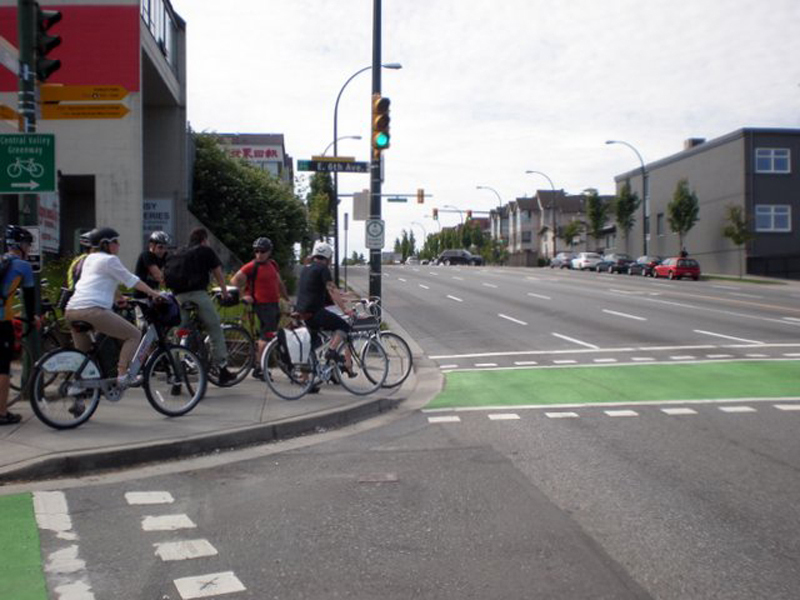 Requiring bike and pedestrian facilities on every transportation project resolves the funding issue by making active transportation an integral part of the overall transportation planning and budgeting process; thus, making separate budget categories for alternative modes of transportation no longer relevant. The politics of transportation are driven by economics. Bicycling infrastructure is the most cost effective means of increasing mobility capacity. Another economic benefit favoring active transportation is the enormous savings in health care costs derived from the exercise afforded by active transportation. In a period of scarce public resources to invest in the public realm, we must invest wisely to get the greatest value. The best return on transportation investments comes first from walking and biking, and next from public transit. The single occupancy vehicle (SOV) falls far behind. Unfortunately, powerful corporate interests have a vested interest in maintaining an automobile dominated urban environment. In a sustainable future, the best transportation energy source is human power, not fossil fuels. “With active transportation you burn fat and get healthier, with cars you burn fuel and get poorer.” Money spent on fossil fuels leaves the local economy, whereas walking and biking keeps spending power in the community. “Walking and biking are antidotes to the social isolation that is enveloping cites around the world.” The world’s most livable cities focus on people, not cars. Cities happen on the streets. People on the streets build vibrant, healthy, livable downtowns – cars do not. Picture beautiful city streets full of people walking and biking – compare that image to streets filled with cars. The automobile takes away public space, despoils air quality, and spews toxins and noise pollution. Most major cities are placing restrictions on downtown automobile traffic and reducing car dependence. Great cities restrict automobile access downtown and reclaim the space for people – giving life and vitality back to the streets and public spaces. If we are to survive the automobile assault on cities and urban environments, we must rediscover how to ‘live’ in cities. Cities must make walking and biking easy, safe and efficient. We cannot give cars a direct route to a destination and expect people who walk and bike to take a longer, circuitous route. It must be the other way around. Urban planning is about creating places where you want to live, where you want to raise your children, and where the elderly want to stay. When you design a street, ask yourself, is it good enough for our children? If not, then it is not good enough. We are investing in a sustainable transportation system for our children’s future. Roads make up our largest public space: streets constitute up to 40% of the downtown area. Highways are single purpose facilities and do not contribute to the tax base. Parking lots and garages eat up more valuable downtown real estate. These spaces are either not taxed or constitute the lowest downtown property values for taxation purposes. Reclaiming downtown space now dedicated to cars, and returning it both to the public realm for public enjoyment and to private development for higher use, can vastly increase a city’s tax base. Cycling safety and the need to reduce traffic speed were major topics: speed is the primary safety issue, and speed management is the key protective measure for cyclists. If you slow vehicular speed and volume sufficiently, you do not need to separate cyclists and motorized traffic. The survival rate of pedestrians and cyclists involved in automobile crashes increases exponentially with a reduction in speed. Collisions with automobiles have a 5% risk of fatality at 20 mph compared to 85% at 35 mph. Bicyclists should not be integrated with automobile traffic on streets with a speed limit in excess of 30 km/h (18 mph). Many European and Canadian cities treat residential neighborhood streets as multi-use public spaces for people and families, and not for the sole use of motorized vehicles. Imposing speed limits of 30 km/h (18 mph) and 20 km/h (12 mph), the streets become safe places for walking, biking and children playing. Canadian Safe Routes to School routes do not exceed 20 km/h. Chicago has implemented 20 mph speed limits on streets in residential neighborhoods. Portland’s adoption of a 20 mph speed limit on all bicycle boulevards required a change to Oregon law. Downtown bicycle corridor traffic signals are being set to 12 mph in Portland, San Francisco, and Vancouver, BC. Separating bicycle traffic and bicycle infrastructure is a tool to increase the number of cyclists, but not the final solution. Speed reduction and increasing the number of cyclists are proven to be the most effective means to improve road safety. Regional transportation planning should combine all modes of transportation under one agency/authority (typical of major Canadian cities). Combining mobility transportation planning under one authority facilitates the integration of alternative forms of transportation and the management of traffic demand. San Francisco has an all-in-one-agency, SFMTA, which includes transit, arterial roads, parking, taxi, commercial traffic, car-share, biking, and walking. SFMTA is responsible for transportation planning, managing transportation demand, and reviews and has over-sight over land-use planning and development. After studies concluded that San Francisco cannot absorb more cars, and transit is operating at full capacity, SFMTA shifted their street planning and funding focus to active transportation modes – walking and biking. Bicycling was determined to be the most cost effective way to deal with growth and change transportation mode share. SFMTA plans to increase cycling’s mode share from 3.5% to 9% by 2018, and integrate alternative modes of transportation to reduce SOV use. However, studies determined this was not achievable with the existing biking culture and infrastructure. SFMTA’s current transportation plans are based upon the development of separated bike paths and cycle tracks to reach that goal. • Our cities and transportation facilities should be designed so that they will be safe for 8 to 80 year-olds. • End the war between planners and engineers and make them partners. Bring land-use and transportation planning together – “plan-gineers.” Engineers are problem solvers and public officials must re-define the problem. Engineering goals should no longer be based upon designing streets primarily for traffic flow and increasing capacity for autos. New objectives are needed to increase the mode share split for alternative modes of transportation, and to make the roads safe for all users, especially vulnerable users, pedestrians and cyclists. Implementing change necessitates establishing new performance measures and criteria for traffic engineers to use. • Transportation engineers will follow the money. Road building has historically captured the most transportation funding. Provide new funding for active transportation and the transportation engineers will find ways to use it. Funding changes the conversation. o Eco-density: density done well facilitates walking, cycling and public transit. o Density uses the “power of nearness” and “completeness of destinations” to design neighborhoods for people and encourage short trips. Public bike sharing programs were a major topic at the conference. They are seen as important complements to multi-modal transportation plans: encouraging public transit use and reducing downtown congestion. Electric bikes (E-bikes) are a logical next step for public bike sharing programs because they encourage longer trips, and overcome barriers such as hills, sweating, over-exertion, etc. Chad Mullins is former chair of the Salt Lake County Bicycle Advisory Committee. Read part 1 and part 2 online at cyclingutah.com (search for Vancouver).